During my initial meeting with Kammy, she answered all my questions — even the stupid ones — without ever making me feel dumb. I am not very astute when it comes to computers or the internet, but Kammy helped me understand and alleviated all of my concerns. Throughout the process of creating my web site, Kammy was always available by phone to explain each step along the way. She even put me in touch with a fantastic editor who helped me create web page contents worth reading. Without both of them, my web site would have been nothing more than a concept. 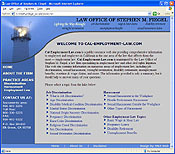 When I first saw the completed web site, I was amazed and proud by how professional it looked! I have received numerous positive comments about it contents and appearance. Kammy did a first class job at a reasonable cost. My only regret is that I did not do this sooner!!!!! !